City College of New York (141 Convent Avenue, New York City). The exhibit in the Spitzer School’s Atrium Gallery includes photographs, architectural models and casts used in construction. It also showcases the 3D computer imaging software used to analyze and draw precise tridimensional geometry. The exhibit is free and open to the public. Viewing hours are 9 a.m. – 5 p.m., Monday – Friday. 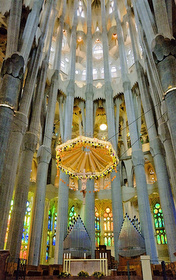 This entry was posted in Spain and tagged Antoni Gaudí, Architecture, Barcelona, Bernard and Anne Spitzer School of Architecture, Catalan Modernism, City University of New York, CUNY, Exhibitions, New York, Sagrada Familia, Spain, Spanish Architecture on May 2, 2015 by Clare Hills-Nova.